I haven’t been able to find Ephraim and his parents in the 1861 census, though there are a couple of likely candidates for his father, both of whom are in jail! At the time of the 1881 census, I think he is living at 56 Railway Grove, St Paul Deptford. There is an Ephraim Wright, 21, labourer, living with a 63 year old widower by the name of George Boxhall, who is also a labourer. Ephraim’s birth place is given as Suffolk.4 It’s possible this is not my man – there are several other Ephraim Wrights born in Suffolk around – but given that this is a year before he marries Mary Jane in a neighbouring area, I think it’s likely to be the right one. My great grandfather Alexander was born just after the census, on June 27th 1891. I’d love to find out where Ephraim was in 1861. If his father was in jail, where would his mother have gone with a baby? I did search a couple of years ago, looking at his mother’s family to see if she’d gone there, but found nothing. Time to have another hunt. I also want to know what his father was in jail for, if indeed that’s where he was. And why did Ephraim move away from Suffolk? I would think it would be because of work, or lack thereof. Maybe following up what happened to his brother Arthur could offer some clues. I also want to check out the places Ephraim was living in against the Charles Booth poverty maps of London, to see what kind of housing it was, what it might have been like. England, birth certificate for Ephraim Wright; 08 Jan 1860, Cosford, Suffolk; citing 1860 Mar [quarter] 04a [vol] 456 [page], General Register Office, Stockport. England, marriage certificate for Benjamin Wright and Mary Ann Peggs; 23 Oct 1858, Boxford, Suffolk; citing 1858 Dec [quarter] 04a [vol] 925 [page], General Register Office, Stockport. “1871 England Census, Benjamin Wright (age 40) household, Polstead, Suffolk,” Ancestry.com (http://www.ancestry.co.uk/ : accessed 11 Sep 2008), citing PRO RG10/1723, folio 96, p 2 & 3, GSU roll: 830763, Cosford registration district, Hadleigh sub-registration district, ED 19, household 11, 02 Apr 1871. “1881 England Census, George Boxhall (age 63) household, St Paul Deptford, London,” Ancestry.com (http://www.ancestry.co.uk/ : accessed 11 Sep 2008), citing PRO RG11/708, folio 58, p 16, GSU roll: 1341165, Greenwich registration district, St Paul Deptford sub-registration district, ED 34a, household 81, 03 Apr 1881. 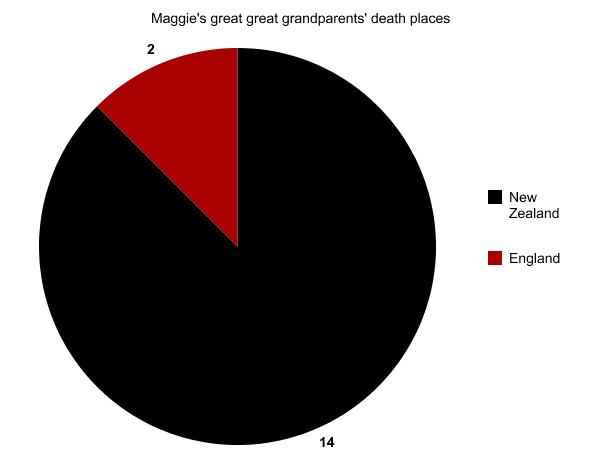 “1891 England Census, Ephraim Wright (age 30) household, St Paul Deptford, London,” Ancestry.com, (http://www.ancestry.co.uk/ : accessed 01 Oct 2010), citing PRO RG12/494, folio 67, p 63, GSU roll: 6095604, Greenwich registration district, St Paul Deptford sub-registration district, ED 2, household 323, 05 Apr 1891. Wikipedia “Typhoid fever”, article, http://en.wikipedia.org/wiki/Typhoid_fever accessed: 2 April 2011. Where did my lovely Mary Jane come from? In the 1901 census, now a widow and living with two of her sons, her birthplace is listed as “Fermanagh, Ireland”.2 Hmmm… these counties are right next to each other, though Fermanagh is (now) in Northern Ireland and part of the United Kingdom, and Monaghan is in the Republic of Ireland. According to the newspaper clipping I have, she was “born of Irish parents in Belfast”.3 That’s a wee way away from either Fermanagh or Monaghan! Perhaps there was some creative licence used by the article’s author…? And my cousin Lally says she was “born and raised in Armagh”.4 So, that’s another county! I’d like to trust Lally’s information because she knew Mary Jane personally, but it doesn’t seem to tie in with anything else. I guess Mary Jane could have been born in one place, and then raised in Armagh? I had been trying to find her in the 1911 census under her married name of Carroll, but not having a subscription to Find My Past meant it would be an expensive credit-chewing exercise checking all the Carrolls in the area. Last night I decided to bite the bullet and sign up – and I found her! Anyway, back to the task at hand. Mary Jane’s birthplace in the 1911 census is…. “Roslea Monaghan Ireland”. At last a townland!! Doing a search using Google maps I found a Roslea/Rosslea in Fermanagh, just near the border of Monaghan, so that makes a lot of sense. I guess the next step is to find out the actual parish, and then go about hunting down a birth or baptism record. So Mary Jane is born around 1856 in Roslea, and by around 1859 the Clark(e)s are in Edinburgh for Annie’s birth. Somehow Mary Jane is back in Ireland (Co Meath) for her daughter Mary’s birth1, and then in Aldershot for son Percy’s birth10. Sometimes I wish my ancestors would just STAY PUT in one village for a few centuries. I guess travel is in the genes. 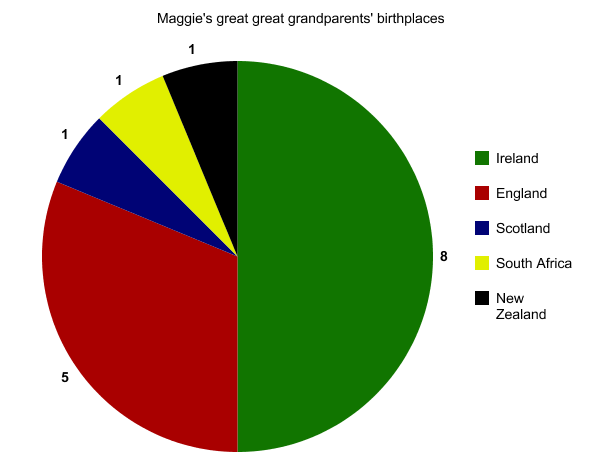 Now, if I can just pin down Annie’s birth in Scotland, I may find Mary Jane’s mother’s name. O Scottish records, how I do love thee! “1911 England Census, John Carroll (age 62) household, St Nicholas Deptford, London,” findmypast, (http://www.findmypast.co.uk/, accessed 14 Apr 1911), citing PRO RG14/2640, Greenwich registration district, Deptford East sub-registration district, ED 17, household 300, 02 Apr 1911. “England & Wales, FreeBMD Index: 1837-1983,” database, FreeBMD (http://www.freebmd.org.uk/cgi/search.pl : accessed 2010), marriage entry for Joseph Patrick Sullivan and Annie Clarke; citing Sep 1883 [quarter] Greenwich 1d [vol] 1487 [page]. “1901 England Census, Joseph Sullivan (age 39) household, Bermondsey, London,” Ancestry.com, (http://www.ancestry.co.uk/, accessed 2010), citing PRO RG13/395 folio 105, p 2, St Olave Southwark registration district, Bermondsey sub-registration district, ED 52, household 12, 31 Mar 1901. “1891 England Census, Joseph Sullivan (age 29) household, Camberwell, London,” Ancestry.com, (http://www.ancestry.co.uk/, accessed 2011), citing PRO RG12/492, folio 62, p 48, Camberwell registration district, St George sub-registration district, ED 26b, household 678, GSU roll: 6095602, 05 Apr 1891. So, on Sunday I headed off into London for Who Do You Think You Are? Live. I had bought a Q-jump ticket to avoid the queues I remembered from last year on the Saturday, but didn’t need to have as it was a lot quieter, with no queues at all to get in. And none of the presentations were booked out either, so I managed to snaffle a couple more tickets. Having been awake since 2am (yay jetlag), I decided to spend most of my time sitting and listening to talks, rather than traipsing around the exhibition floor. After grabbing the extra tickets, I lined up to get a photo dated by Jayne Shrimpton at the Family Tree magazine stand. 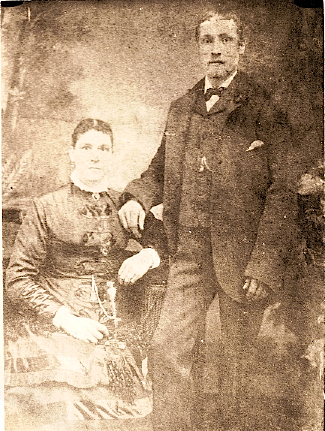 I had a good idea who the couple were in the photograph – my great great grandparents Mary Jane Clark and Ephraim Wright – but couldn’t be sure, and wanted a date for confirmation. On the back of the photograph, in handwriting I don’t recognise (a couple of relatives in that family were great at writing of the back of photos, but this wasn’t from one of them) is the inscription: “Dad copied this from a very old & faded photograph of your father and mother. Thought you would like one.” Ephraim died at the age of 33 in 1894, and we have no photographs of him, so I was excited to find out if it was possibly him and his wife Mary Jane. She married three times, so I really needed the date. Jayne gave a date range of 1876 to 1883 (wow! so impressed she could be that specific – wanted to ask her more about how she could date so precisely, but didn’t want to take up more than my allotted time), and also said that it looked like a standard wedding photo. Ephraim and Mary Jane were married in 1882 in Lewisham, Kent, so this fitted perfectly! I had a quick look around some of the stands, then headed off to the theatre for the first talk – Behind the Scenes with Ainsley Harriot, one of the celebrities featured in a previous UK series of Who Do You Think You Are? I wouldn’t have bothered with going, but it was nice to sit and relax for an hour, and it was interesting enough, though I didn’t learn anything useful for my own research. Straight then onto my next presentation: Reading the writing of the past – Barbara Harvey (replacing Dominic Johnson). An interesting topic, would have been better as more of a “hands on” workshop I think. Barbara did a good job if she was drafted in at the last minute. Now onto the workshops I had prebooked. First up was: My ancestor was in the parish registers – John Hanson. I had attended a very similar talk last year given by Else Churchill (in fact, I recognised some of the same images), but I think I got a lot more out of it this year, having actually started looking at parish records. Really enjoyed this, great speaker. With only 15 minutes between talks at this point, I was thankful they were all in the same place or nearby, so I had a chance to grab a bite to eat in between! Next up: Records of deaths and burials – Alec Tritton. Well, this was a bit disappointing. Covered some of the same material as John Hanson’s talk. Alec mentioned that he’d had to cut his usual 90 minute talk on the subject into 45 minutes, and it showed. To be fair, I was possibly flagging a little at this point. The online handout should be useful. Phew – little bit of a breather here. Had a prebooked Ask the Experts session, and got some direction on how to tackle a brick wall concerning a great great great grandfather. I then had a chance to wander around the stands and check out some of the books for sale – and grabbed a discounted copy of Phillimore’s Atlas and Index of Parish Registers, which I had been wanting. I also had a chat to the membership officer for the Suffolk FHS. Last workshop of the day was: Irish records – beyond the obvious, with Rosalind McCutcheon. Oh, what a joy and delight this woman was! I was worried that I’d be falling asleep by the end of the day, but no fear here! Lovely speaker and lots of useful information. Handouts of all the above presentations and more besides are available online at the Society of Genealogists website.